Rangers from the Central Land Council (CLC) now have the capacity to track threatened species in both English and Warlpiri as part of a comprehensive data collection, storage and management system supported by the Atlas of Living Australia (ALA). 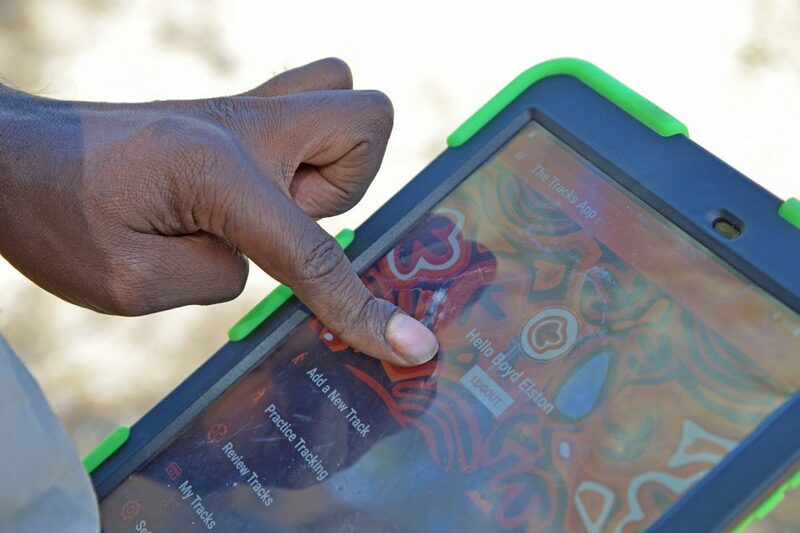 “Our Warlpiri rangers love the app,” said ranger co-ordinator Josie Grant from the Central Land Council. “The rest of us use the English version and can’t wait until we can have it in our first languages as well,” said Ms Grant who grew up in the Tennant Creek region and speaks Warlmanpa and Warrumungu. The first use of the new app will be a Bilby Blitz focusing on cross border surveys of the endangered Greater Bilby (Macrotis lagotis). Twenty ranger groups from the Northern Territory and Western Australia are combining their local knowledge and tracking skills with digital technology to conduct hundreds of base line bilby surveys by recording tracks, scats, diggings and burrows on Aboriginal land during March and April. The data recorded through The Tracks App will update and expand existing knowledge about bilby distribution and inform the national bilby recovery plan – the first national threatened species plan developed with significant input from Aboriginal people. “The Bilby Blitz is a ground breaking threatened species program for a culturally significant animal, a two-way ecological case study that demonstrates the critical role Aboriginal people play in protecting our country,” said CLC director David Ross. The Tracks App enables data such as animal tracks, scats, diggings and burrows to be recorded in the field and stored and analysed in the ALA. The app, hosted and maintained by the ALA, collects the rangers’ tracking data in a standardised way, allowing the results to be analysed across time and sites and to be compared with future surveys. This will enable land managers and conservationists to detect local changes in biodiversity, as well as monitor broader impacts of feral species and climate change across Australia’s desert regions. The Tracks App was funded by the Australian government and developed as a collaborative partnership between the CLC and the ALA. The ALA is made possible by contributions from its many partners. It receives support from the Australian Government through the National Collaborative Research Infrastructure Strategy (NCRIS) and is hosted by CSIRO. This blog has been adapted from an ALA article. Read the original article here.